The apostle Paul emphasized the importance of the resurrection when he wrote, “If Christ has not been raised, your faith is futile and you are still in your sins” (1 Corinthians 15:17). If the resurrection did not take place, our faith is meaningless. This is why the resurrection of Jesus Christ has long served as the greatest issue of debate among skeptics. Yet a shift has taken place at the academic level in recent years. The historical evidence for the events surrounding the life, death, and resurrection of Jesus have become so established that virtually every scholar concedes He lived, died by crucifixion, was buried in a tomb, that the tomb was empty on the third day, and that many had appearances of Jesus following these events. For the past 40 years, resurrection scholar Dr. Gary Habermas has tracked this revolution among 4,000 of the world’s top New Testament scholars. In our series “The Historical Evidence for the Resurrection that Even Skeptics Believe” we discuss the key facts involved in this academic revolution and how it applies to you. Many of these scholars are still atheists or agnostics. If they believe these facts are true, how can they hold this view? The answer is that even though the facts are true, they do not want to follow Jesus personally. You won’t want to miss these programs. This month, I am making all five programs in this series available on Blu-ray and DVD as a thank you for your gift of $49 or more. And if you would like, I am also making available our five-program series with Dr. Habermas and Dr. Antony Flew called “Did Jesus Christ Rise from the Dead?” You can request both series featuring 10 programs for your gift of $98. Please see the enclosed card for additional details. This year, one of our main goals is to reach two million people who have never heard about Jesus. Our goal is to provide an audio Bible in their native language and invite them to a weekly gathering where they will be able to listen to the Bible with others and discuss what they have learned. In addition, approximately 955,000 people in these new groups have come to faith in Christ as they have listened to God’s Word! This includes over 50,000 new believers in the past month who will spend eternity with God through your overwhelming generosity. Thank you! nother blessing to share is the acquisition of our new Global Communications Center. Through your prayers and gifts, we purchased this building debt free. However, much work remains to transform this former art gallery into a new work of art to bring the gospel to new people worldwide. The estimated cost to complete the Global Communications Center is $250,000. If you and our other donors would prayerfully consider an additional gift of just $25 this month, we would be well on our way toward furthering our worldwide impact. As I noted in my previous letter, God has opened an opportunity for us to bring audio Bibles to China. Since there is a shortage of pastors in China and oral learning is the preference among all ages, this is the best way to bring God’s Word to China. A friend of Faith Comes By Hearing has committed to matching gifts toward 4,000 Audio Proclaimers for China. 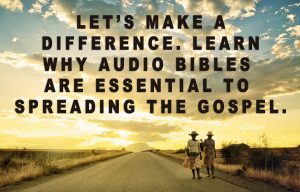 We would like to meet this need by asking you to consider giving toward an Audio Proclaimer this month. There is a need for Audio Proclaimers for as many as 8,000 churches. With your gift of $500, your gift will be matched and you will be giving 2 Audio Proclaimers. If you give $1,000, you will be providing 4 Audio Proclaimers. If you give $5,000, you will be providing 20 Audio Proclaimers. This is a unique opportunity to provide audio Bibles for people in China. I hope you will help us. In addition, if you give a gift of $500 or more for audio Bibles, I will send you our new series with Dr. Gary Habermas on Blu-ray and DVD as a thank you. If you wish, you may call us now at 1-800-805-3030 or respond with the enclosed card with your gift. For the past three years, our team has been developing a 40-session video discipleship series for the people of India. In doing this project, we realized it is for the entire world. We are now completing post production of our final programs in English, while translation is currently taking place in Telugu, Hindi, and Tamil for India, as well as Russian and Ukrainian. Future goals for this series are to translate it into the major languages of the world. Through translation into the world’s top 12 languages, we can reach approximately two-thirds of the world’s population. And with nearly 90 percent of the world population now living in areas accessible to an online connection, we can literally help make disciples of all nations through smart phones and other devices worldwide. Each language costs about $20,000 to translate (not including airtime). As funding becomes available, we have translators for Albanian and Finnish ready to begin. In addition, you can personally enjoy this online discipleship series right now. Log on at JAbible.org or access the content from our mobile app. We hope these resources will help you better grow in your spiritual journey. Even better, you can use these programs as part of a mentoring group or small group Bible study. Simply show the video, discuss the content, and encourage one another in the joy of following Jesus. We’re also excited to announce a new broadcast language this month—Albanian! Through our partnership with TV7 in Albania, the 5.4 million speakers of this language will now have access to our television programs. Albanian is the official language in Albania, as well as in Kosovo and the Republic of Macedonia. Despite many difficult years of political upheaval and war, God is working in powerful ways among the people of Eastern Europe. Please pray for God to open the hearts of those who discover our programs in this new language. God has offered us many opportunities to reach people for Christ this month. However, we cannot do it without you. 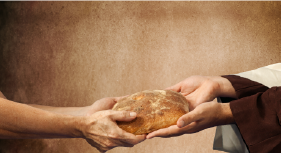 Through your overflowing generosity, people will come to faith in Christ, grow in Him, and share Him with others. You may not be able to personally take the gospel message to the nations of the world, yet together we can see many lives changed through our ministry together. I look forward to hearing from you soon.